The plastic mats under the rolling chairs in our home office have seen better days. 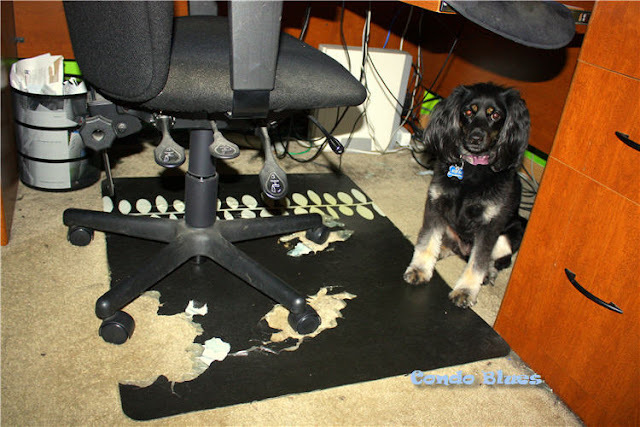 No matter what kind of office chair mat I buy, it eventually cracks, breaks, and sheds plastic chunks all over the carpet in the office. I need to use a chair mat under our rolling chairs to protect the carpeting we aren't ready to replace. Replacing the mats every couple of years isn’t sustainable. More than that it is a pain! I solved our problem by making durable office chair mats from laminate flooring I bought at the Habitat Restore. I went with laminate flooring instead of plain plywood because I was concerned the plain plywood office chair mats would crack and break. Laminate flooring isn’t my favorite look but it is built to do the job I need it to do – be a floor. I’m also using this as a test to see if I can deal with the look of laminate flooring in my house because we might be upgrading soon. I feel comfortable with what I bought because Mohawk flooring is made in the United States and passed 60 Minutes' formaldehyde testing. Your floor protector isn't protecting the carpet anymore, Lisa. Also, would it kill you empty the paper recycling bin in the office once in awhile? Yeesh! 1. 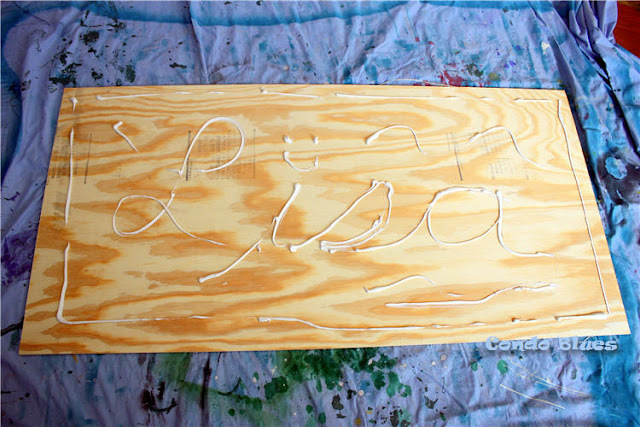 Apply construction adhesive to the plywood. Me: We’re running out of construction adhesive. Husband: How? 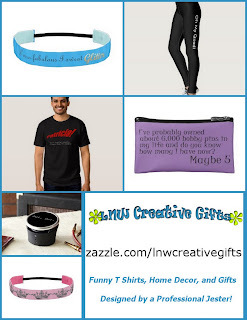 You just bought some! 2. 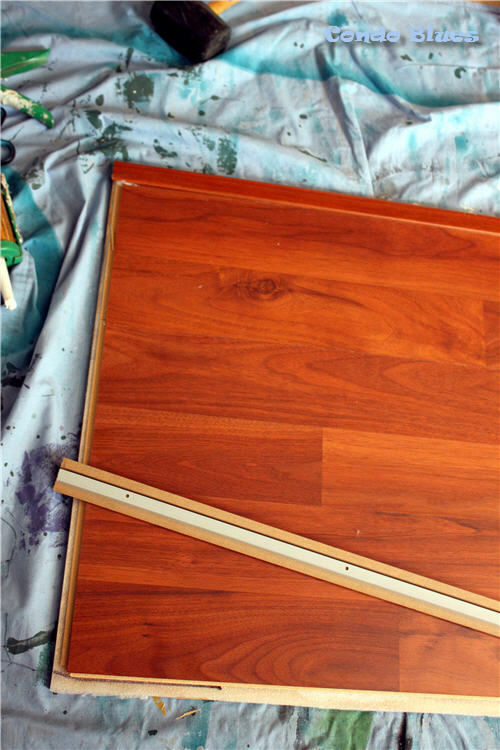 Glue the underlayment to the plywood and trim it to size with the scissors. Use your dog as a paperweight if needed. I suggested Lisa glue the underlayment first to make trimming neatly and to size easier. 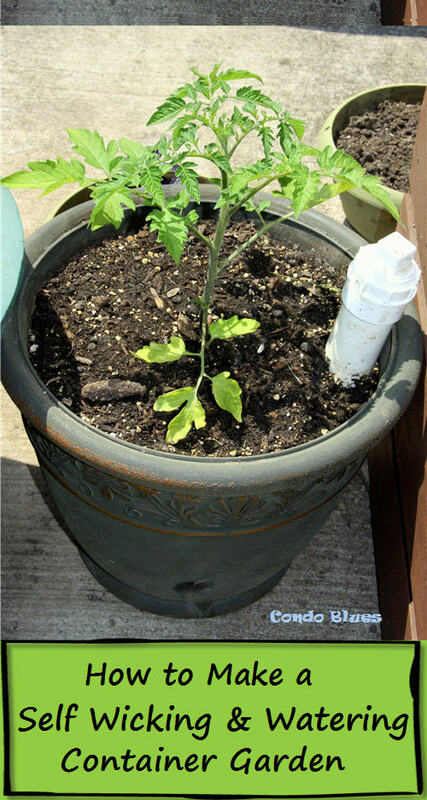 She made a hot mess doing it the other way and had to start over. She’d be lost without me. 3. 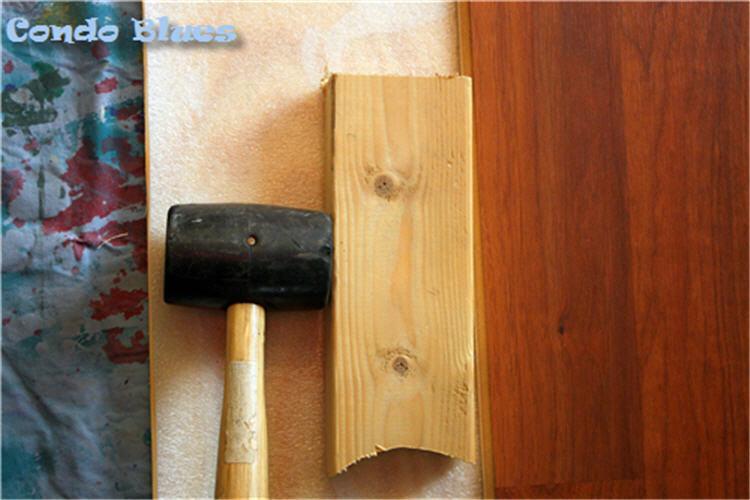 Install the laminate flooring according to the directions in the box using the rubber mallet and block of wood to tap the boards together if needed. My flooring is designed to click into each piece and float above a sub floor. Since my project is using the flooring as it isn't’ intended, I applied a few dots of construction adhesive to the bottom of each piece of flooring before I installed it just in case. 4. 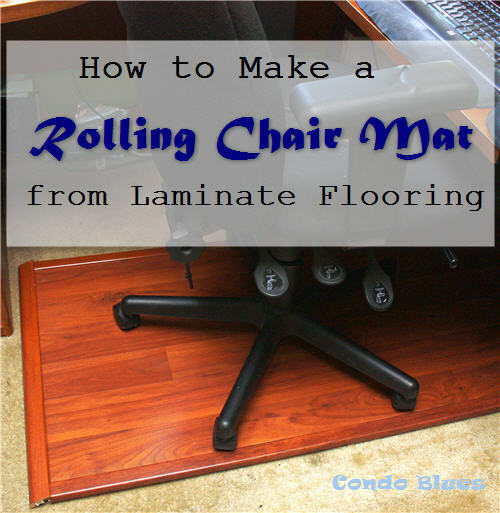 Cut the laminate molding to fit all four sides of your chair mat. I used my miter saw. A circular saw or hand saw works too. 5. 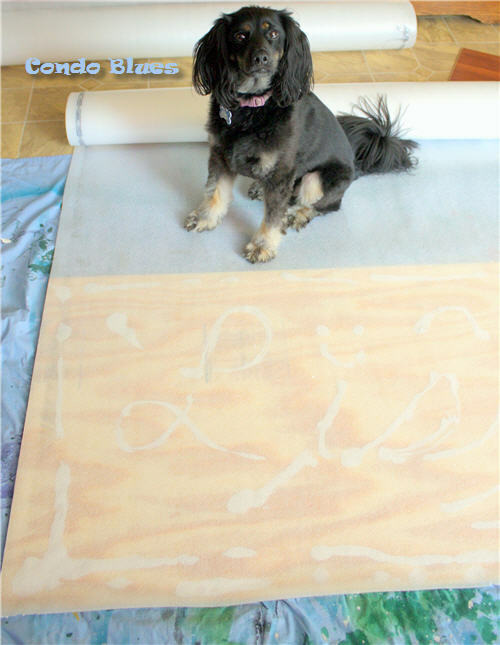 Run a bead of construction adhesive to the bottom of each piece of molding and attach it to the side of the chair mat. 6. Use the nail gun or hammer to nail the molding to the plywood base. 7. Countersink the nails into the molding by tapping them with a hammer and nail set until they are flush or slightly below the wood molding. 8. 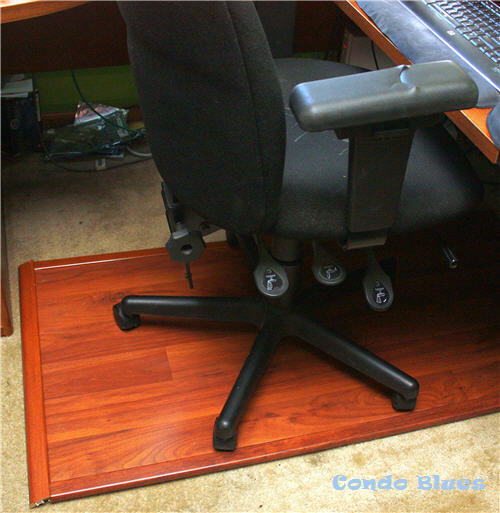 Put the wood chair mat under your desk, put your office chair on top, and get to work!